Why Switch from Blogger to WordPress? Great question! Teri Blaschke from Hidden Valley RV Park in San Antonio, TX asked me that very question over on Google+. My first instinct was to say – “Just because!” or “It was time for a new look.” Blogger has been part of my life since 2008. For the past 4 1/2 years, Blogger has been my choice of blogging tools. For a more comprehensive answer to the question, I decided to google “Blogger vs WordPress.” As expected, google returned way too many results (over 60k). 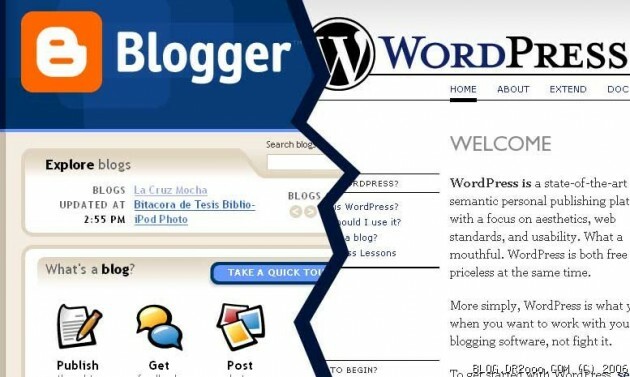 The first link was from an article written by Preston Gall in March 2012 published on ComputerWord titled Blogging Service Shootout Blogger vs. WordPress. You can read the article by clicking here. After a brief introduction, Preston compares/contrasts Blogger and WordPress in the six areas listed below. Preston’s conclusion is pretty accurate – Blogger is free, much simpler to set up and easier to use. Blogger blog is hosted by Google. WordPress is more complex, has stronger social networking integration and offers more powerful customization features, some with minimal annual fees. WordPress comes in two flavors – WordPress.com provides an on-line user interface meaning there is no requirement to download any software to you computer. Your blog is hosted by WordPress at no cost. WordPress.org provides full feature off-line application that is downloaded to your computer. Your blog is then uploaded to a web host of your choosing. For a different perspective, I found an article written by Paul Santosh and published on Hell Bound Bloggers in December 2011. Click here for that article. His article briefly discusses three points that he feels makes Blogger a stronger platform than WordPress. SEO (Search Engine Optimization) – Google owns Blogger and is the premier search engine on the internet. The conclusion is that Blogger blogs are at an advantage when using Google search engine. FREE – This is true. There are no costs associated with managing a blog in Blogger. Using WordPress, I have to pay to map my domain to WordPress and I have to pay to customize a free third-party theme. 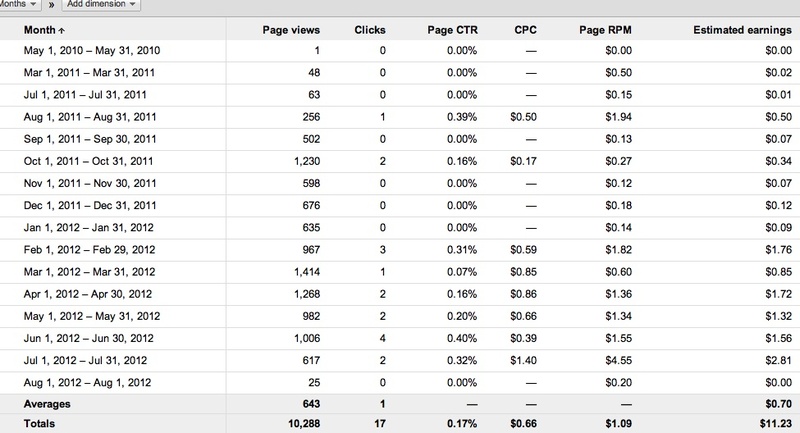 Monitizing – AdSense is Google’s pay-per-click monitizing program. It is a snap to add that on blogger. I’ve not yet added any pay-per-click monitizing program to our WordPress site. I signed up for AdSense in May 2010. Since then, our blog has generated 10,288 page views and 17 ad clicks. This resulted in a net income of $11.23. (Summary chart provided below.) The sites that make good money using Google AdSense have a lots of followers, which results in more ad clicks. Paul’s article tends to defend Blogger not by saying why it is superior but by saying it is on par with WordPress. Blogger and WordPress both provide domain names such as waggintailsrv.blogspot.com or waggintailsrv.wordpress.com. Since I own the domain waggintailsrv.com, I can map that name to the blogger (free) or WordPress (Small Fee) name. One final note. I was able to port my Blogger post to WordPress easily. I do need to update the some blog links in previous posts. So far I am please with my decision. So, back to the question Terri asked me. Why did I switch? I was ready for a new look and wanted a bit more control over the look and feel of our blog. I hope you like the new look.